Trapping fur-bearing animals, processing their hides and trading these for manufactured goods was the dominant factor in the economy of the Northwest Territories throughout much of the 19th century and early 20th century. For many Dene, Métis and Inuvialuit it was a way-of-life, as traditional as hunting and fishing. 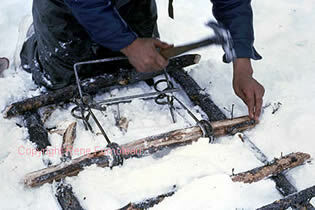 While today the economy of the Northwest Territories is largely wage-based, trapping remains an important part of a northern traditional lifestyle, especially in the smaller, mostly Aboriginal communities. Over the past hundred years the value of furs has fluctuated greatly and with these fluctuations the people of the Northwest Territories have seen both good times and hardship. Over the past thirty years modern trapping and the fur trade has been seriously affected by the animal rights movement. The dramatic drop in the value of furs has meant that it was no longer possible to make a living trapping and forced many Dene and Inuvialuit into the wage based economy. The hardship this has caused in northern communities was immeasurable. Over the past few years a steady increase in the price of furs sold in southern auction houses has sparked a renewed interest in the trapping industry in the Northwest Territories. While it’s unlikely trapping will ever recover to a point where it will once again dominate the economy its still possible that this renewed interest will have a positive effect on many of our isolated northern communities.